EcoPure’s water purifier is the ultimate alternative to bottled water, delivering ultra-safe drinking water right to your kitchen sink or refrigerator. Designed to eliminate any waste water during filtration, this system in NSF certified to reduce numerous potentially harmful contaminants from your water source, including lead, chemicals, bacteria &amp; viruses, etc. while retaining good minerals purely for improved taste. The encapsulated filter design and automatic shutoff feature means filters changes are quick and mess-free, so you can continue keeping your family safe. 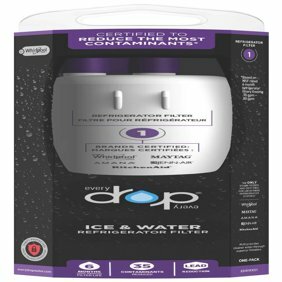 CUTTING-EDGE: This smart system automatically shuts off when you need to replace your water filters, preventing contaminant breakthrough. Plus, the encapsulated filter design means filter changes are quick and mess-free. No tools required. No need to shut off water supply. No touching dirty filters. EcoPure’s water purifier is the ultimate alternative to bottled water, delivering ultra-safe drinking water right to your kitchen sink or refrigerator. Designed to eliminate any waste water during filtration, this system in NSF certified to reduce numerous potentially harmful contaminants from your water source, including lead, chemicals, bacteria & viruses, etc. while retaining good minerals purely for improved taste. The encapsulated filter design and automatic shutoff feature means filters changes are quick and mess-free, so you can continue keeping your family safe.